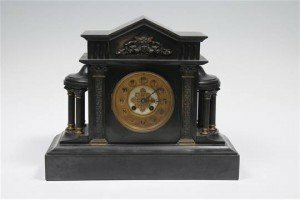 A Victorian black slate architectural mantel clock with 12cm dial with Arabic numerals, foliate pierced centre the two train movement striking on a coiled gong, the architectural case with a leaf and mask frieze above leaf and flower chiselled columns flanked by cupolas with reeded fluted columns raised upon a plinth base. 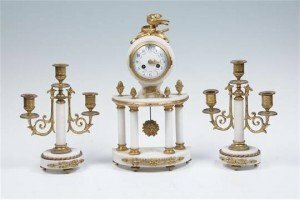 A late 19th century gilt metal and marble mantel clock garniture, the clock with an 8.5 white enamel dial with arabic numerals painted with festoons, the two train eight day movement with outside count wheel striking on a saucer bell, and a pair of conforming two branch candelabra raised upon circular white marble plinths. 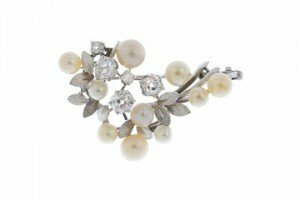 A cultured pearl and diamond spray brooch. Designed as a series of scattered old-cut diamonds and cultured pearls, with textured foliate detail. Estimated total diamond weight 1.45cts. 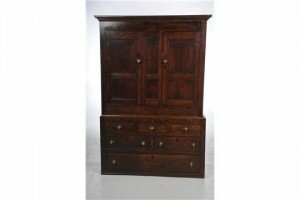 A 19th century North Walian hall cupboard with alterations the cavetto cornice above a mahogany cross banded frieze and two panels flanked by two cupboard doors, later shelves, the lower part with three faux drawers, two short and one long drawer, brass handles raised upon a plinth base. 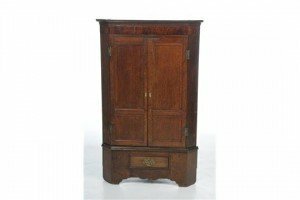 Early 19th century oak and mahogany cross banded hanging corner cupboard on stand, with a cavetto cornice above a mahogany frieze and a pair of panelled cupboard doors enclosing shaped shelves and three spice drawers, the lower part possibly later with a panelled frieze drawer. 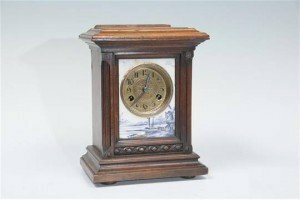 A Victorian and stained wood Delft tile mantel clock with a 9cm brass dial with Arabic numerals, the two train Enfield movement striking on a coiled gong, the dial surmounted with a tile depicting windmills and boats on the shoreline raised on a plinth base. 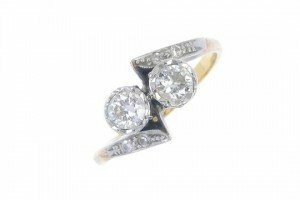 A mid 20th century 18ct gold and platinum diamond two-stone crossover ring. The old-cut diamond collets, to the single-cut diamond asymmetric shoulders and plain band. Principal diamond estimated total diamond weight 0.45ct. A pair of sapphire and diamond cluster ear pendants. 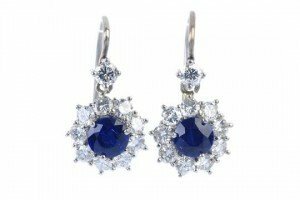 Each designed as a circular-shape sapphire and brilliant-cut diamond cluster drop, to the brilliant-cut diamond surmount. 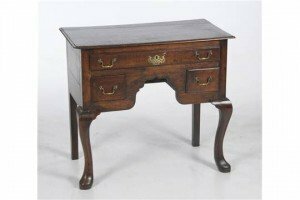 An 18th century style oak low boy, the rectangular moulded top above an arrangement of three drawers, shaped apron raised upon front cabriole legs, plain rear legs. 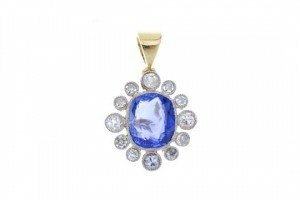 A sapphire and diamond pendant. The cushion-shape sapphire, within a graduated brilliant-cut diamond surround, suspended from a tapered surmount. Estimated total diamond weight 0.50ct. A pair of diamond and enamel ear pendants. 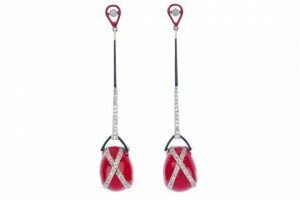 Each designed as a pear-shape red enamel drop, with brilliant-cut diamond cross detail, suspended from a pave-set diamond and black enamel articulated bar, to the single-cut diamond and red enamel pear-shape surmount. 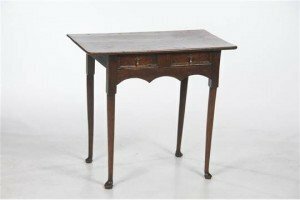 An 18th century small oak side table, the rectangular three plank top above a frieze drawer with two moulded panel fronts, a shaped apron raised upon slender tapering legs of cylindrical form and pad feet. 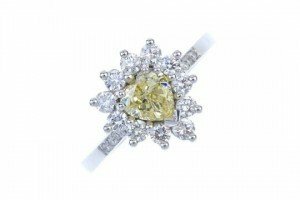 An 18ct gold coloured diamond and diamond cluster ring. The heart-shaped ‘yellow’ diamond, within a brilliant-cut diamond surround, to the similarly-cut diamond shoulders. Principal diamond estimated weight 0.60ct. A pair of lapis lazuli ear clips. 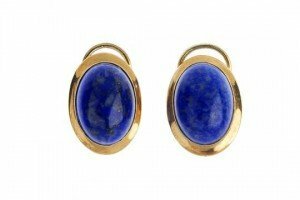 Each designed as a oval lapis lazuli cabochon, within a collet setting, to the hinged fitting. 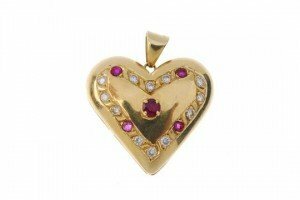 A ruby and diamond pendant. Of heart-shape outline, the brilliant-cut diamond and circular-shape ruby border, to the central circular-shape ruby highlight, suspended from a tapered surmount. Estimated total diamond weight 0.50ct. 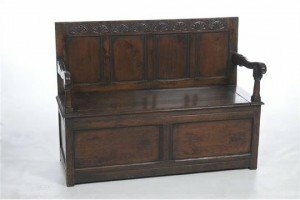 An 18th century style oak box seat settle, 20th century, the rectangular four panel back with a lunette carved frieze, hinged lid above two panels, panelled sides raised upon stile feet. An early 20th century reverse-carved intaglio and gem-set brooch. 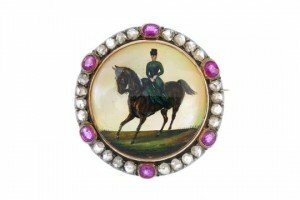 The circular-shape rock crystal, reverse-carved to depict a woman on horseback, with mother-of-pearl back, to the rose-cut diamond and oval-shape ruby spacer surround. 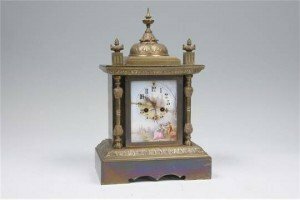 A 19th century French porcelain mantel clock, with a 8.5cm chaptering, the porcelain panel cracked painted a gallant and his companion in landscape, with a two train gong striking movement contained in an ornate gilt brass case with a spire finial raised upon a plinth base. An emerald and diamond cluster ring. 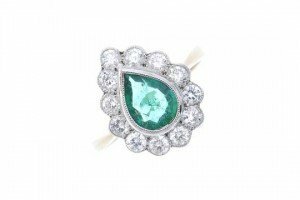 The pear-shape emerald, within a brilliant-cut diamond surround, to the plain band. Estimated total diamond weight 0.80ct. 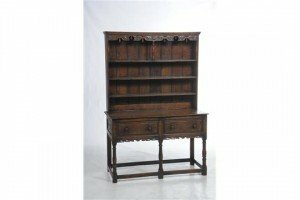 An 18th century style oak high back enclosed dresser 20th century with a leaf and acorn pendant frieze above three plate rails, the lower part with a rectangular moulded plank top, two frieze drawers above a shaped apron raised upon three front baluster legs.